Machine builders have production issues that many job shops don’t face. They are typically working on very long running projects. They don’t have the luxury of just having people out on the floor pushing buttons cranking out thousands of parts. Machine builders are very concerned about job costing and seeing where they are at in a project. Some machine builders will build similar machines, with maybe a few changes. While others will build one-of-a-kind machines that they may never see again. 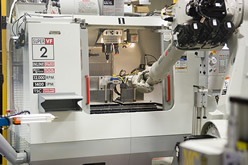 Many machine builders would not only like to see how they did on the entire project, but how well they fared on making the components that go into the machine. Certain sub-assemblies can make or break on how profitable the job ends up. E2 job shop software can handle an unlimited number of levels in the Bill of Material (BOM). E2 also handled the real time job costing off the shop floor so you have the visibility of seeing how each sub-assembly is doing, both from a costing perspective and scheduling aspect. The E2 scheduling engine will also ensure that the parent/child relationship is created so all of the children will be completed in time for the parent assembly. E2 purchasing will also give you the peace of mind knowing that all materials and purchased components will be purchased on an as needed basis. You don’t necessarily have to purchase everything ahead of time.